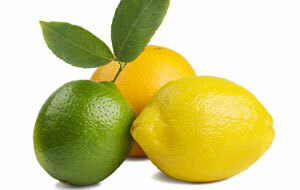 Two of summer’s most renowned citrus are lemons and limes. Small in size but big in flavor, lemons and limes complement a wide variety of foods and dishes: from poultry and seafood to guacamole to salad dressings. And they are a key ingredient for a variety of refreshing drinks: from homemade lemonade to the mojito cocktail to a lemon-lime-berry smoothie. If you want to add a bold burst of lemon flavor to a dish, you can zest the peel right into a dish, such as pasta with basil and tomatoes; orzo with parsley; cremini mushroom risotto; and more. Lemon and lime zest is as popular as lemon and lime juice! Have you ever wondered why a cook will squeeze lemon or lime juice onto sliced avocados or apples? It’s because of the lemon’s high vitamin C content, which helps prevent discoloration of the flesh once it’s exposed to air. Lemons and limes are an excellent source of vitamin C, and their phytonutrients and flavonoid compounds are believed to have anti-cancer properties. And it you’re fighting a sore throat, add the juice of one lemon to an equal amount of hot water for an anti-bacterial gargle. During summer, get creative in the kitchen with the wonderful flavors of lemons and limes.